Using best glass tables in your home will not only make it look modern but will also help you to stand out from the rest. Having a trendy glass table in your dining or living room catches the attention of many people who include visitors. Therefore, you will need to upgrade your game when it comes to selecting those unique glass tables for your dining. In the 21st century, there are many glass table designs that you may want to incorporate in the dining room so that you can make your home look modernized. If you are wondering about how you can understand using best glass tables in your home, you landed in the right place. For a minute, let’s get away from the normal glass table designs that you have seen in homes. Some designs have become outdated, and it’s now time to try out new things. Most homeowners are sued to having the conventional rounded r rectangular dining table which can be used for family meals. In the 21st century, glass customization techniques make it possible to cut glass to desired shapes. Cutting a hexagonal glass table is a common trend in society. A hexagonal table is considered to be ideal for use in homes that have confined spaces. Ideally, with this type of design, you will need to identify a suitable center position where you will place it so that it does not occupy too much space or cause congestion. It is recommended that from the center of the table to the edges, the radius should be considerable and allow for the free movement of users around it. Also, for it to be a perfect addition to your home, you should consider having a glass table that has its stand installed at the center. This way, every user on the table has enough leg space at any one time. Round glass table tops are considered to be trendy tables for dining room use. Usually, most homeowners buy rounded glass tables that are fixed and cannot rotate around. With the rotating design, there are two layers of glass table tops which are installed with a considerable distance between them. The lower glass is smaller in radius than the top one for rotation and trendiness. The smaller lower glass is movable while the top glass is fixed to the center stand. With the low r glass, it can be rotated to pass essential items such as table salt or sugar when there is a meal. With this type of glass, you will need to place the salt on it and rotate it in the direction of your choice until the salt is delivered to the person on the other side. You do not need to pass the salt around by stretching your hands across the table which would seem unethical. 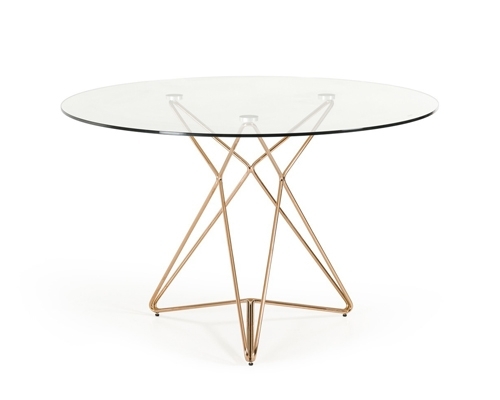 This design might be a trendy table for the dining room but can be delicate if not well maintained. The rotating wheel should always be greased to reduce the friction during rotation. Where do you store your crockery? They are mostly kept in the kitchen and are brought out only during meals. This way when setting up your dining table before the meals, you will be required to move up and down from the kitchen to get the crockery. With the inbuilt drawers in your dining table, you will simplify the process of setting it up. A single drawer is installed for each user where they can find their crockery at any time during a meal. Also, the drawer can be partitioned inside such that a user can put their mobile phones or other accessories in them when having a meal. It would be the best choice for many homeowners who need to improve the elegance of their dining room. If you are in need of getting a trendy table for the dining room, you should consider this design which will blow your mind out and make the room look trendy and classy. Having a colored glass for your dining table is possible today. Thanks to the technology that is available in the 21st century. If you are looking to add more warmth to your dining room, you should consider trying colored glass tables. The glass tables can come in the color of your choice if you need to match with the theme of your home. Most homeowners cannot choose matching colors and are recommended to seek the services of an interior designer who which will be helpful in the long run. Fab glass and mirror may sell to you colored glass table tops which you can use to customize your trendy dining table.